Now forget about those traditional knives and board cutting. Just use fast and safe food scissors to cut everything in the kitchen. 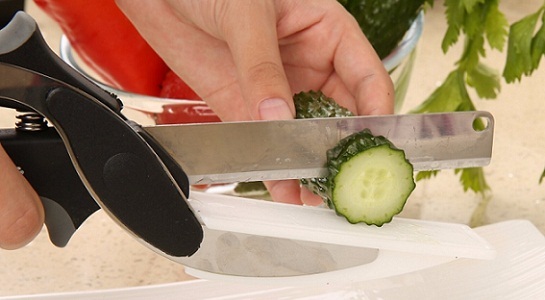 Its ergonomically designed handles allow for easy squeezing action and smooth cutting. This food scissor is so smart that it will replace all your kitchen knives and cutlery with one easy to use a device. This 2-in-1 Knife & Cutting Board is a fast and easy way to chop vegetables, fruits, meats and much more. Its hardest stainless steel blades are enough to handle most of the kitchen things.